Looking for channel partner support? Home » Blog » Disaster recovery: how important is it for your business to always be contactable? Disaster recovery: how important is it for your business to be contactable? Don’t just have a plan to recover from business interruption, have a plan to maintain continuity during an incident too! How would it affect your business if your phones were out on one or more of your sites for a day? Having a Disaster Recovery plan for your IT and business communications is a must to help your IT team get things back up and running again swiftly following any unplanned downtime. But you should be thinking business continuity first! Having a Business Continuity plan will help to prevent any unplanned incidents having a negative impact on your business operations and, if unavoidable, help to minimise the effects. The two will work together to ensure that any loss of service is brief and your customers will experience a seamless service regardless of what is going on behind the scenes. Watch our short video explaining how unplanned downtime can affect a business as it grows and more importantly, how to utilise your communications to avoid it! The right technology can help keep communications open, even if an office is forced to close due to an unforeseen event. 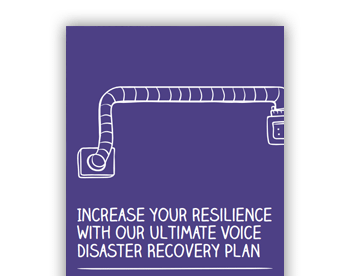 Plan your voice disaster recovery plan with help from our eGuide. Firstly you need to choose the right solutions to support your business. Make sure the products you choose are inherently resilient, flexible and easily scalable. Traditional technology is dated and can leave your business at risk unnecessarily. Next generation alternatives to ISDN such as SIP trunking and hosted telephony have built in business continuity features. Whether it’s a firewall to protect against cyber threat, automatic failover in the network to a secondary location or the ability to easily create and manage call routing plans in the event of bad weather closing one your sites. Choosing the right solution can help save your whole IT team a lot of stress, along with protecting the productivity of your business. Many businesses only think about putting a recovery plan in place after a disaster has already occurred. That is a very costly approach and can be the equivalent of someone telling you to mind your head… after you bump it! They’ll be various levels of reaction required depending on the interruption – best bet is to acknowledge these scenarios first. For example if your receptionist can’t get into the office due to sickness or weather conditions, you’ll want to redirect your switchboard calls to somebody who can take them. This is completely different to the process you’d need in place if one of your sites was entirely unreachable due to a fire or flood. Our telephony experts have put a voice disaster recovery plan together to get you started – you can download this above. To find out more about how you can use voice solutions to implement and support a disaster recovery plan, avoiding costly downtime, please visit our Inbound page or contact one of our experts on 0333 014 0000. The views in this article are the personal views of the author and are not necessarily endorsed by Gamma. © Gamma Telecom Ltd. All Rights Reserved.